Only by trying out high-quality bed sheets can you often appreciate their positive impact on sleep quality. A comfortable bed sheet set that meets the specific needs of the sleeper is an essential ingredient for a restful night’s sleep. At Au Lit, find your perfect set from our large selection of bed sheets of all kinds. Choosing a bed sheet set starts with identifying your basic and personal needs. Once you have determined the features you are looking for (softness, warmth, hypoallergenic material, easy maintenance, etc. ), you can choose the material that best meets your needs. 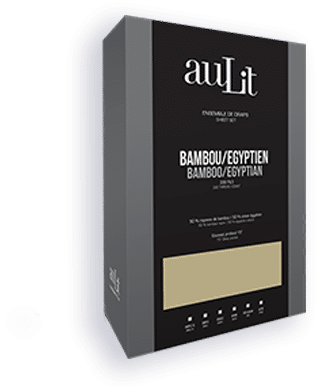 Au Lit offers you a wide variety of sheets made from different premium quality materials, all designed to promote a healthy sleep. Not all cottons offer the same benefits. Combed cotton is softer and more resistant than regular cotton. However, Egyptian cotton is the most luxurious, with longer and softer fibers that are even more resistant. The main benefit of polyester sheets is their resistance to wrinkling. However, this synthetic material should be avoided if you sweat excessively at night, since it breathes less effectively than natural fibers and retains heat. In recent years, bamboo has been in fierce competition with cotton, and for good reason. It is even softer and more breathable than cotton and naturally keeps dust mites away. This fiber is developed from wood cellulose (especially eucalyptus). It was created around 1990 and has a growing following. It is a very eco-friendly material that is breathable and long-lasting. Made of acrylic or a polyester/acrylic blend, “health” sheets retain body heat very well, which appeals to the most shivery people. However, this synthetic material doesn’t allow air to circulate as freely as natural fibers. A true winter classic, flannel is a cotton fabric that has been brushed to enhance its fibers. This process provides more softness and warmth to the fiber. The number of threads per inch is a good indicator of the quality and comfort of a bed sheet set, but it shouldn’t be the only factor to consider. For example, a sheet with 400 threads per inch can be a better product than a sheet with 800 threads per inch if the material, fiber processing and weaving are superior in quality. However, these last two characteristics are not listed on the label, so it is important to consult a sleep product specialist for advice. The percale label, which refers to a type of weaving, ensures a minimum of 180 threads per inch. Satin weaving is more glossy but offers a comparable softness. 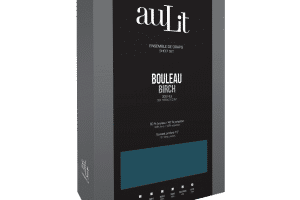 Why buy your sheets at Au Lit? 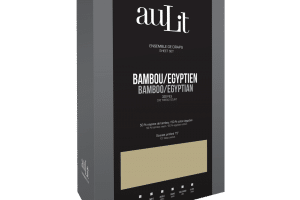 Au Lit not only offers a large selection of leading brand name sheets, it also guarantees a friendly service and hassle-free shopping experience. Need expert sleep advice? Visit us in one of our many shops.